Is Your Small Practice Ready for ICD-10? - Outsource Management Group, LLC. 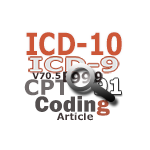 Medical Billing » Blog » Is Your Small Practice Ready for ICD-10? It’s 193 days to ICD-10 and to be honest, that’s not much time! It’s time to get your practice ready to use ICD-10, but where do you begin? There’s no question it can be overwhelming! Here’s the steps we recommend to any Providers that ask. Let’s get started. First things first, you need to assign the task of overseeing ICD-10 to someone on your staff. It doesn’t matter whether that person is the biller, a coder, the office manager, or someone else. Their goal is to lead the process, ensure things are on task and on target, and to oversee the details. It is important to outline your goals and then assign a timeline for when each of those goals will be achieved. This part of project management is essential to completing the project on time and on budget. This is one of the most important components in the preparation of your 1CD-10-CM. You need to identify your codes that are going to be used in your practice. The best way to know which codes you are most likely going to use is to take some time to review your super bills. You also need to ensure that your coding staff have the knowledge they need in order to be able to properly code and understand the documentation of the provider. You might be surprised to learn this includes a sound knowledge in physiology, basic anatomy and medical terminology. It’s likely that there are lots of services you automatically provide as a result of a specific diagnosis. You will need to find this in the contracts you have and then ensure you are using ICD-10-CM for the services that you perform, because if you do not know what the new code is you are not going to be paid for the services you provided. For the ICD-10-CM, coding it is critical to have the best possible documentation. Right now, you need to start evaluating the documentation you have in place. Determine where you have deficiencies and where there needs to be more education in order to fulfill the requirements of ICD-10-CM coding. Some believe that EHRs (electronic health record) will take care of this, but others are skeptical and rightfully so. The majority of auditors will tell you that most physicians are not currently providing the necessary documentation for ICD-10-CM coding to be successfully implemented. For providers, you will need to assess and review your current documentation to evaluate if your documentation has the necessary ICD-10-CM details included in it. When you do this assessment, it should also include the mapping of the ICD-9-CM codes to the new ICD-10-CM codes for the most commonly billed codes. You should identify your existing deficiencies. Doing this is going to clearly define the specific information that you are lacking to ensure that you have accurate ICD-10-CM coding happening, and it will allow for payer testing and provider training to occur at the same time. You may require additional staff during this temporary workflow change and/or to conduct your assessment. The CMS estimates that clinical staff and provider training for ICD-10-CM will take 8 10 16 hours. For coders it will take 24 to 40 hours and for IT staff it will take 4 to 8 hours. It will be necessary to offer some type of classroom training. It will also be necessary to have strong communication between the coders and providers. You should have a discussion with your software vendor, billing service, clearinghouse and payers to ensure that all of them are ready for ICD-10-CM claim testing. Ask your vendor whether your HER system and practice management will need upgrading in order to be able to handle the new diagnostic codes. If yes, you will need to know what upgrades will be needed. Ask your billing service, clearinghouse and payers whether their software will be able to accommodate the new ID-10-CM codes as well as when you will be able to begin testing. You will need to schedule times that you will be able to send test transactions and then review those results after the testing is complete. This is the time to work out any glitches. These eight steps are, in my opinion, the most important areas to concentrate on during your ICD-10 preparation.